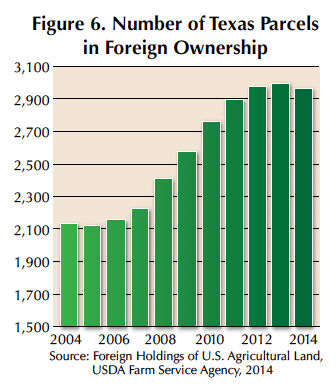 Texas ranks second in states with the most foreign-held land, with 2.9 million acres under foreign ownership. 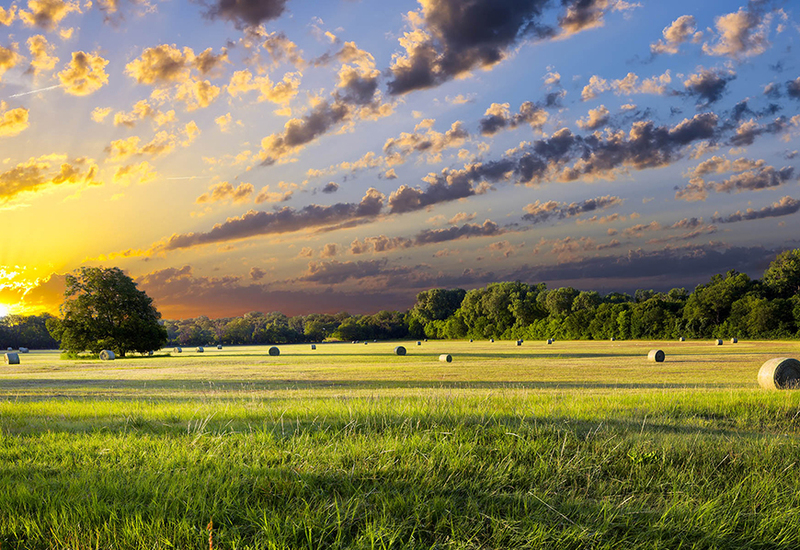 Forest, pasture, and cropland are in highest demand. Failure to comply with AFIDA can result in substantial penalties to buyers. ​Foreign buyers occasionally appear in rural land markets responding to changes in the economic environment. In the 1970s, a weak dollar unleashed a flood of foreign investors buying real estate, including agricultural land. That surge caused alarm in the economy's agricultural sector, with critics decrying the surrender of control over productive U.S. land. Congress responded, adopting the Agricultural Foreign Investment Disclosure Act (AFIDA) in 1978. After an initial report by owners, rules implementing AFIDA further specified, “All foreign persons who acquire or transfer an interest in agricultural land thereafter are required to report such transactions within 90 days . . . " (Foreign Holding of U.S. 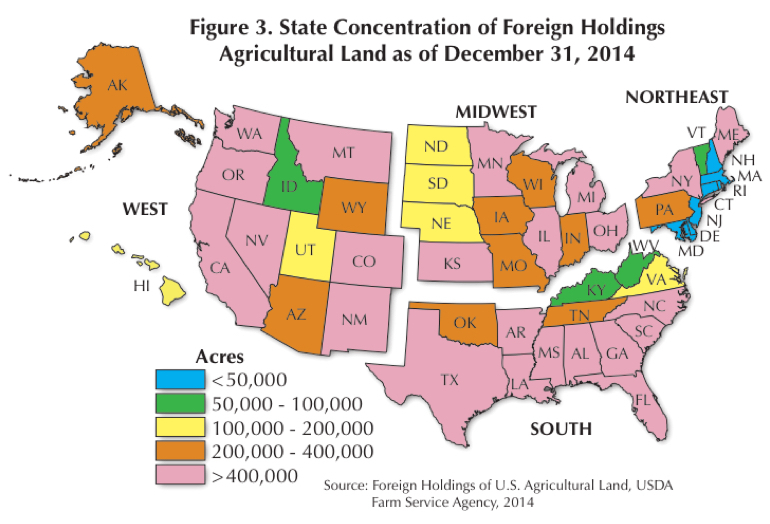 Agricultural Land Through December 31, 2014, Farm Service Agency [FSA] – U.S. Department of Agriculture). Owners comply by filing a form FSA-153 with the Farm Service Agency, which provides that form on their website https://forms.sc.egov.usda.gov/eForms/welcomeAction.do?Home. Failure to comply can result in a “civil penalty of up to 25 percent of the fair market value of the interest held. . . ." This potentially serious consequence makes it imperative participants in land transactions involving foreign owners study the AFIDA requirements. AFIDA mandates reports for agricultural land greater than ten acres in the aggregate. The definition includes land used for timber production, farming, and ranching within the past five years. Owners of interests in tracts of ten acres or less that produce more than $1,000 in sales of​ farm, ranch, or timber products must also file a report. Security interests such as mortgages and mineral interests do not require filing. AFIDA regulations also exempt leaseholds of less than ten years and certain other future interests. Otherwise, the owner must report “any interest" to FSA. Foreign person as defined by AFIDA includes all individuals who are not citizens of the United States, the Northern Mariana Islands, the Trust Territory of the Pacific Islands, or those lawfully admitted for permanent residency in the U.S. Further, AFIDA considers entities created under the laws of foreign countries or with their principal place of business located there to be foreign owners. In addition, the act requires U.S. entities in which there is a significant foreign interest or substantial control by foreign persons to register. Ownership of 10 percent of an entity by an individual or 50 percent by a group of individuals constitutes a significant interest or substantial control under AFIDA. Reports published by FSA provide more details on definitions and requirements. The reports are at https://www.fsa.usda.gov/programs-and-services/economic-and-policy-analysis/afida/index. 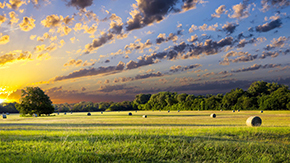 The FSA annual reports (2015 is now available) provide an account of the total acreage in foreign ownership as well as a breakdown of the types of land held. Reviewing those reports affords an insight into foreign activity in rural land markets nationally and down to the county level. 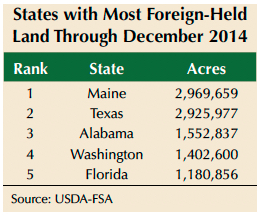 The table lists the top five states for acreage held in foreign ownership with Maine ranking slightly ahead of Texas. Most of the Maine acreage consists of forests. Texas, Alabama, and Washington also support substantial expanses of forested acreage. ​In fact, forestland composes the largest category of foreign-owned land nationwide (Figure 1). From 2006–08, major timber producers divested their land holdings, obviously transferring many acres into foreign ownership. 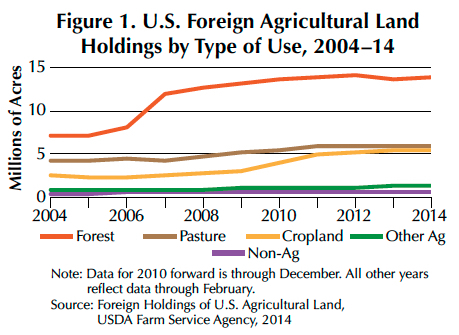 After 2008, the three main categories of agricultural land in foreign ownership began to expand (forest, pasture, and cropland) with foreign holdings growing substantially through 2011. 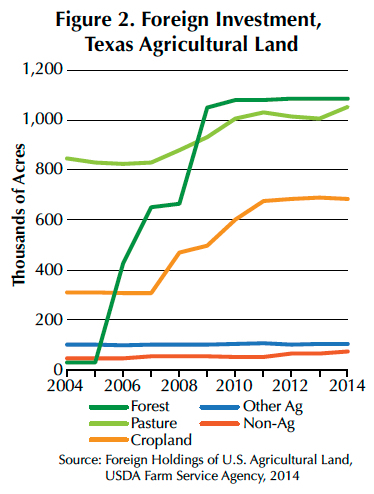 Cropland holdings continued to increase through 2014 while timber and pasture holdings remained steady. The Texas experience somewhat mirrored national trends. The major departure from nationwide trends focuses on the forestland dynamics where foreign ownership exploded from 2006 through 2009, vaulting it from the smallest category to the largest, a place it maintained through the 2014 reporting cycle (Figure 2). Most of this expansion transpired in the pine timber region of East Texas and involved purchases by Canadian-owned entities. Pasture and cropland holdings grew substantially beginning in 2008 and continued that enlargement through 2011. From 2012 through 2014, holdings in all categories stabilized. Currently, anecdotal reports from the field suggest foreign purchasers from China may be fueling another increase in foreign ownership. Future FSA reports for 2016 may confirm this trend. The national distribution of foreign-owned acreage and the distribution in Texas by county are shown in Figures 3 and 4. Much of New England has little foreign ownership. 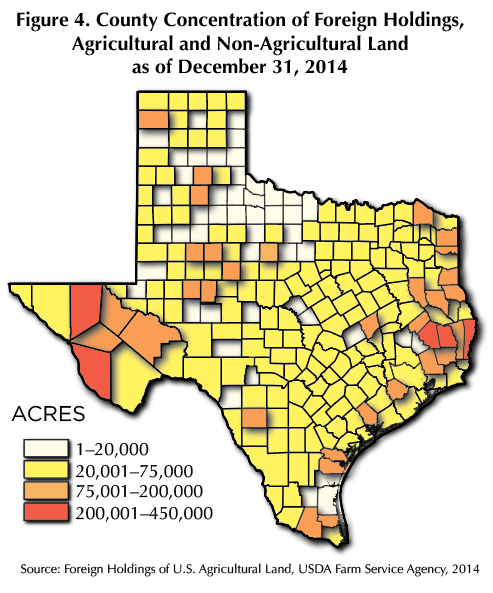 ​​The largest acreage holdings occur in East, South, and West Texas (Figure 4). 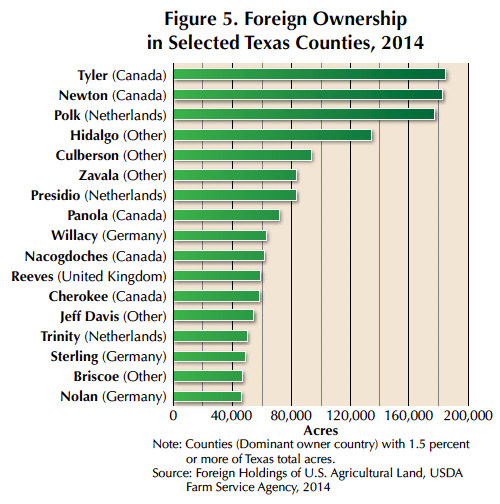 Tyler, Newton, Polk, and Hidalgo Counties have the largest acreage concentrations of foreign ownership along with the country of origin for the largest owners (Figure 5). ​FSA reports identify the country of origin for the five nations with the largest land holdings by acreage and identifies those remaining as “Other.” The Other category comprises the foreign ownership in Briscoe, Culberson, Hidalgo, Jeff Davis, and Zavala Counties. Canadian owners dominate in five counties, all in the timberland region of East Texas. German owners prevail in Nolan, Sterling, and Willacy, perhaps focusing on cropland. The Netherlands appears in the forested areas of Polk and Trinity, but also in Presidio in West Texas. Ownership based in the United Kingdom focused on Reeves County. The report documents a substantial expansion of parcels owned by foreigners, growing by nearly 40 percent from 2004 levels and 33 percent since 2007 (Figure 6). Texas should anticipate the potential for this statistic to expand as future markets see interest from foreign entities.